New course, new organiser, new race! It is not known if Dostinex trazodone tablet shape is found in breast.. 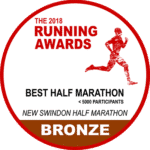 The New Swindon Half Marathon is a operating name of 113 Events Limited.